Prime Minister Benjamin Netanyahu said during a speech on Wednesday (August 29, 2018) his country would take, "strong and determined action against Iran's attempts to station forces and advanced weapons systems in Syria". 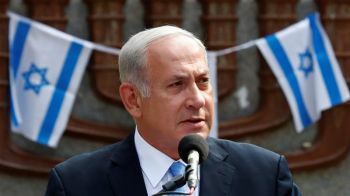 "No agreement between Syria and Iran will deter us; neither will any threat deter us," said Netanyahu at a ceremony naming Israel's nuclear facilities after late president Shimon Peres. Iran's military attache to Damascus said Tuesday his country's military advisers would remain in Syria under the defence agreement signed the previous day. "Support for Syria's territorial integrity and the independence of Syrian sovereignty were also emphasised in the agreement," Brigadier-General Abolghasem Alinejad said. Tehran has provided steady political, financial and military backing to President Bashar al-Assad as he fought back against a seven-year uprising. Israel has sought to avoid direct involvement in the conflict but acknowledged carrying out dozens of air strikes in Syria to stop what it says are deliveries of advanced weaponry to its Lebanese enemy Hezbollah. It has also pledged to prevent its arch foe Iran from entrenching itself militarily in Syria, and a series of strikes that have killed Iranians in Syria have been blamed on Israel. In May, Israel hit dozens of military sites in Syria after accusing Iran of launching rocket and missile attacks towards its forces in the occupied Golan Heights. Israel launched air strikes on three Syrian military facilities in July following the incursion of what it said was a Syrian drone into its airspace in Quneitra province. Israel's prime minister said there was a "simple truth" in the Middle East and elsewhere in the world where "there's no place for the weak". "The weak collapse, get butchered, are erased from history. And the strong, for better or worse, are the ones who survive. "The strong are the ones who are respected, the strong are the ones with whom alliances are struck, and eventually the strong are the ones with whom you make peace." wish they'd say and do that do Toronto. It'd be a blast.